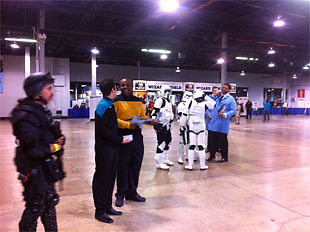 To enter the Comic Con 2012 Wizard World convention in Chicago, you must first line up with hundreds, if not thousands, of people sporting an array of popular culture costumery spanning decades. From Catwoman to Minecraft, Captain America, and Spider-Man to zombies, there&apos;s a good chance you&apos;ll also see at least one character from every television show on AMC&apos;s roster. 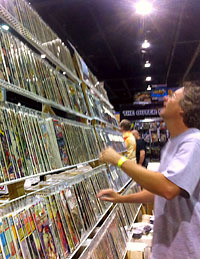 When they let you into the convention, you pass through a tunnel of Stormtroopers and into the fantasy world of every 10-year-old who ever peeled back the plastic on his or her favorite comic book, trading card or action figure. On one end of the massive Donald E. Stephens Convention Center in Rosemont, you can rifle through stacks of new and aging comic books selling for $2 each. Look up and you&apos;ll see framed classics for upwards of $60,000 or more. Collectors hold notepads or printouts of their wishlists in one hand and stacks of comics in their other. Eventually you&apos;ll find rows of people sitting at tables drawing on large and small pieces of paper. They are the artists. Some are well known and popular for their art or their collaborations with writers or other artists. Some have Marvel and D.C. on their calling cards. 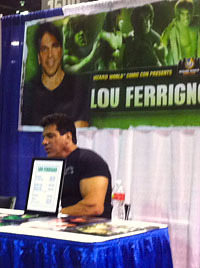 And some have their own private booths where fans stand in long lines to get their favorite comic books signed. Popular superhero co-creator Stan Lee tends to fit this description, and fans young and old line up holding Hulk, Spider-Man and X-Men comics for the mustachioed patriarch of comic books to sign. Behind Lee&apos;s private booth is a row of tables where Rodney Ramos sketches some dark lines on a postcard-sized piece of paper. He says he&apos;s an inker. "It&apos;s enhancing pencils and giving it a style and a look," Ramos said of being an inker. "Think of it as a cinematographer in film, he brings life to the scene in color and texture." Ramos has worked for Marvel and D.C. comics for 25 years. He&apos;s been attending Comic Con events for most of those 25 years as well. Ronnie Dukes, who uses quill and ink on hand-made paper from Nepal, is attending his first ever Comic Con. He draws a series called the Vitruvian Hero, based on Leonardo da Vinci&apos;s Vitruvian Man. "I decided after 10 years of exhibiting work that I wanted to tell a complete story and have it out there," Dukes told me. "I really need to take this seriously." Beyond the artists and the sci-fi celebrities, you&apos;ll find find the kitsch. The Gandalf keychains, Tron-style plates and Uruk-Hai scimitars are available along with gaming dice, plush toys and life-size action figures. Comic Con is at once entirely familiar and at times a double-take in terms of costumed conference-goers. A winged creature flutters by followed by a black-suited woman and characters I can only assume are still imaginary, just waiting for their turn as art on the pages of a comic book or a screenplay and a show.